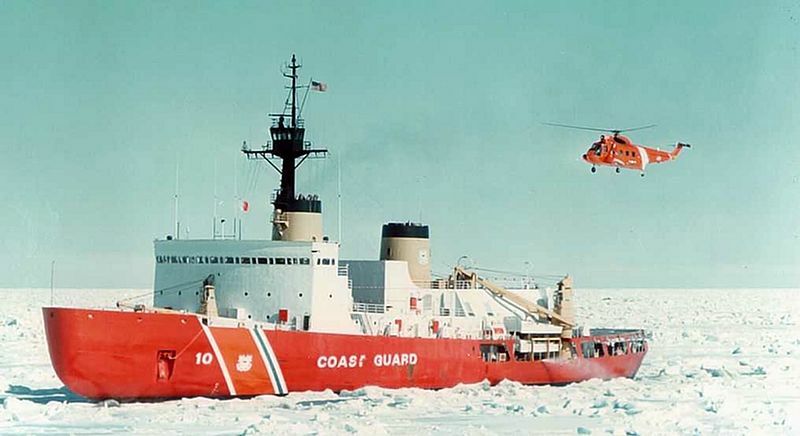 USCGC Polar Star. USCGC photo. During this year’s deployment, one of the ship’s electrical systems began to smoke, the Coast Guard said, causing damage to wiring in an electrical switchboard, and one of the ship’s two evaporators used to make drinkable water failed. The ship also experienced a leak from the shaft that drives the ship’s propeller, which halted icebreaking operations in order to send scuba divers in the water to repair the seal around the shaft. A hyperbaric chamber on loan from the US Navy aboard the ship allows Coast Guard divers to make external emergency repairs and inspections of the ship’s hull. No one knows how long the crew can keep her going, but there is a good chance we are going to see serious problems before the new ship is ready. This entry was posted in Antarctic, Budget, icebreaker, Uncategorized by Chuck Hill. Bookmark the permalink. I had the privilege of touring one of the Polar Class Icebreakers, maybe 10 years back and the stories of the problems due to age and the tough environment were shocking at times, well past the time to get new equipment and hats off to the dedicated CG personnel that keep the Polar Star running year after year well past it’s design lifetime. I guess the Coast Guard can do what NASA did with the space program; ask the Russians to do it for us. So sad! The USCG could charter a heavy breaker, or could book space on an existing heavy breaker. Because the MAIN driver is it will be 5 to 7 years before the USCG Polar Security Cutter is IOC. Where would you find one? There are not many in service, particularly the heavy variety capable of breaking into McMurdo, and most icebreakers are needed in their home waters during the northern hemisphere winter. Nice photo of divers working on the prop shaft here as well.